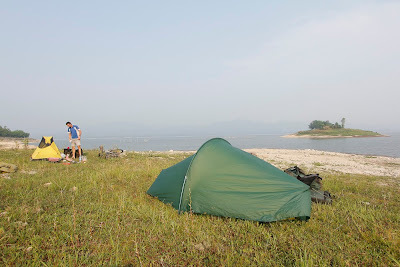 Morning at our camp at the Sri Nakharin Lake. Kevin is making coffee and oatmeal. Ready for another day of cycling. A typical lunch restaurant in a mountain village on the road. Small country roads in a farming landscape. Kids getting ready to soak the crazy foreigners (falang bah!) with their buckets of water. 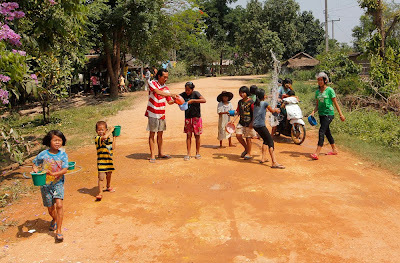 Songkran water festival in western Thailand. During the fifth day we basically cycle east ocer two nountain passes. After that we follow the eastern edge of the Western Forest Complex to the north. 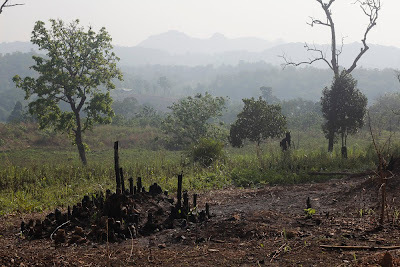 Farming, forest, and mountain landscape near Ban Khli Thi. 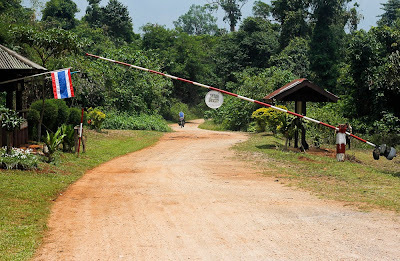 One of the checkpoints on the road from Ban Khlity to Sri Nakharin Lake. We cycle back the same way we came during most of the day. It's a bit disappointing but still a beautiful landscape to travel through, and great cycling. 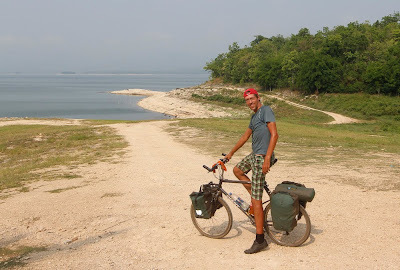 We also miss out on the steep climbs on gravel and concrete slabs near the Nakharin lake. 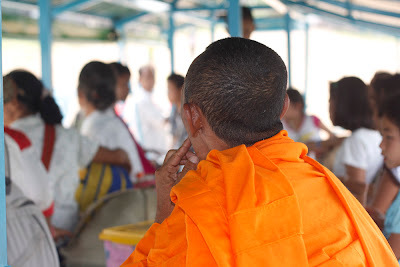 Monk and kids on the ferry across the Sri Nakharin Lake. 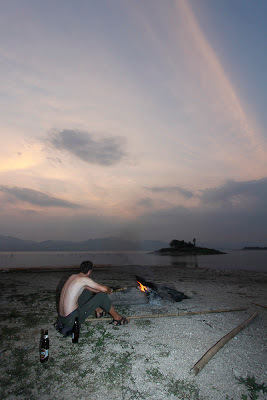 We get to the lake shore and the little ferry on the beach at 2 p.m. and we leave for the western coast at 3 p.m. An hour later we arrive on a similar beach on the Si Sawat side of the lake. Enjoying a cold beer (Beer Leo) at the camp fire on the beach at sunset. Sri Nakharin Lake, Kanchanaburi Province. We camp on the beach near the ferry. There is a small hamlet with a restaurant where we buy a couple of cold beers. We swim and wash in the lake. Misty morning in our camp on day three. Lam Khlong Ngoo National Park, Western Forest Complex, Thailand. We have oatmeal and coffee for breakfast before we keep cycling north further into the wilderness. We see another road junction and a small restaurant but mostly jungle and some very noisy bamboo forests. The noise comes from cicadas. Ear plugs would be good here. There is also a ranger checkpoint but no questions asked. 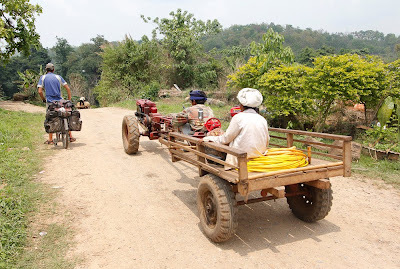 Local farmers on the way to remote fields. Ban Khli Thi, Western Forest Complex, Thailand. 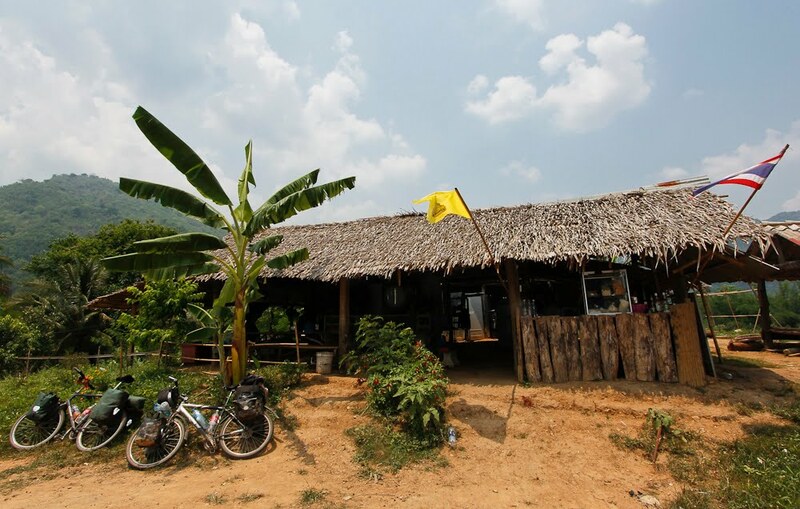 We arrive at the remote village of Kli Thi (sometimes spelled Ban Khli Ti or Ban Klity) in the early afternoon. There is a restaurant with a small shop here so we sit down and have a bowl of noodles, and do some last shopping (snacks and noodles). A man who speaks good English explains that there is no road to be found that could take us north to places like Umphang or Ban Palatha. There is only jungle, he says. He reckons it would take a lot more than a week to walk through. He lives up here so we kind of trust his knowledge on this. It's a bit disappointing, but we are still eager to try to get as far as possible into the wilderness to see for ourself even if we just have to come back the same way. We continue north on the road to the park headquarters for Thung Yai Naresuan Wildlife Sanctuary. Our man says it's eight kilometers to go. On the road to West Thung Yai Naresuan Wildlife Sanctaury - one of the largest and most remote protected areas within the Western Forest Complex. As we arrived at the ranger station checkpoint we had our second disappointment. They told us that we can't continue into the park. We insisted to talk this through, and they informed us that a permit is needed. We told about our phone calls and a young lady took us to the main office where we were promised a phone call to whoever gave us this information. We made the call and I handed over the phone to the lady and here colleague, and they still said we can't go. We moaned about this and tried to take it all in, while studying a 3d model of the park. After a few minutes the lady tells us that she has spoken to the officer on the phone and that we can now get a permit, but only to go as far as the second ranger station inside the park, at about thirty kilometers from the headquarters. 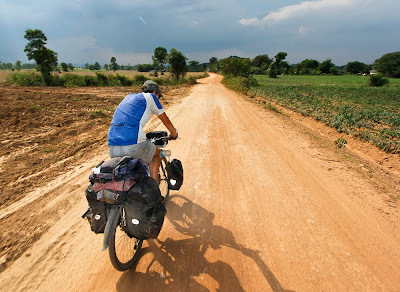 This is good news in the circumstances, but we wanted to go all the way to the Burmese border area (approximately 100 kilometers) and continue north to Umphang or Palatha. That was the grand plan. The lady also tells us that we cannot leave the road, that we have to report at the ranger stations (15 and 30 kms respectively) and that we cannot camp because of dangers. We have to make it to the ranger station for the night. When I ask here to be more specific she mentions tigers. I assume she just doesn't want us to camp, because tigers would probably want to stay far away from humans if they have a chance, and they do; They have 18 720 square kilometers to roam. Local villagers coming out of the rain forest. Thung Yai Naresuan Wildlife Sanctuary. We promised to follow the instructions and started cycling into the dark rain forest. We had been warned about the road conditions but it turned out a bit worse than we expected. After just a few hundred meters we had to get off our bikes and push through flooded areas with deep mud. 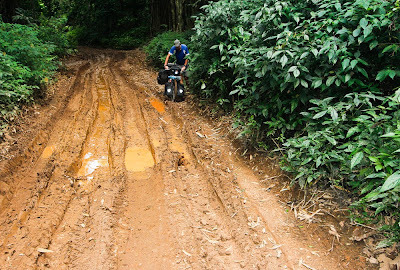 We could still cycle through some of the ruts or on the side, but the obstacles got more frequent as we got deeper into the forest. It takes a lot of time to travel like this and it was already late in the afternoon. 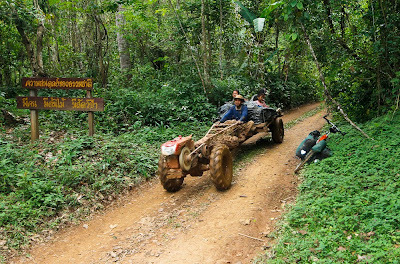 Poor road conditions in the West Thung Yai Naresuan Wildlife Sanctuary. Deeper into the forest the road got worse (even a bit worse than on the photo above) and we had to push through deep mud ruts full of water. We thought we may be able to get to the next ranger station before dark, or at least to higher and hopefully drier ground, but we also thought about going back the same way the next day, because they didn't give us a permit to go further than ranger station two 30 kilometers into the park. 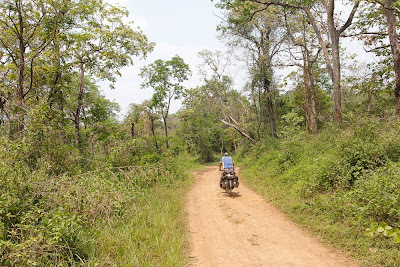 We didn't think we had much chance of making it through the dense jungle off-road and we would be easy to track and stop if we tried to sneak past the checkpoints. A decision had to be made. We decided to go back. 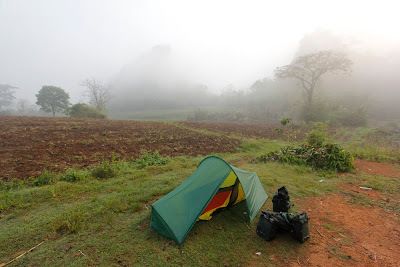 We camped on a hill near Ban Khli Thi.